"The Lotto 6 aus 49 - Twice every week from the German Lotto"
The German Lotto is more than 55 years old and is run by German Lotto and Totoblock (DLTB). The Deutscher Lotto- und Totoblock (DLTB) is a collaborative partnership which is made up of the 16 independent national lottery companies (Lotteriegesellschaften) operating throughout the 16 individual States of Germany. Each one of these 16 member Lotteriegesellschaften acts independently of each other and from time to time takes charge of running the German Lottery and Totoblock for a period of three years when it takes over the chair and presidency of the DLTB. The lottery games offered by the DLTB are all approved at national level and sold right across Germany and beyond. The German Lotto 6aus49 is one of the richest European lottery games and pays out up to € 2.8 Billion to lottery winners each year. The German Lotto is a traditional draw-style, lotto jackpot game and is the flagship game offered by the German National Lottery. The German Lotto 6 aus 49 was first drawn by Lotto Germany on October 9th 1955 and has been the most popular lottery game throughout the whole of Germany since the beginning. The average jackpot produced by the German Lotto is higher than most National Lotteries at € 5.24 Million. Draws for the German Lotto 6aus49 take place twice per week on Wednesdays at 6.25pm and Saturdays at 7.25pm and the numbers are drawn at Saarland Radio in Saarbrücken. The German Lotto uses what is known as a double matrix of 6/49 plus 1/10 which means that the 6 main numbers are firstly drawn out of a range of numbers from 1 to 49 followed by a Super Number – Super Zahl – which is then drawn out of a range of numbers from 0 to 9. So – when you are playing the German Lottery you will need to first select your 6 main numbers from 1 to 49 and then an extra number – the Super Number or Super Zahl – from 0 to 9. The Super Number – Super Zahl – is used to determine prizes for the Jackpot category plus prize categories 3, 5, 7 and 9. If you match all 6 of the main numbers plus the Super Number drawn – then you will be the lucky winner of a first category prize – the German Lotto 6aus49 jackpot. The Lotto 6aus49 jackpot starts off at € 1 Million and for every draw that the top prize is not won – it will rollover and the resulting increase will be added onto the jackpot for the following draw – making for an even larger jackpot to be won. In addition to the jackpot itself – there are 8 further ways in which you can win on the German Lotto – which means that are a huge number of prizes to be won twice every week. A “Quick-Tipp” facility is available when playing the German Lottery – very much the same as the “Lucky Dip” option that is used in the UK National Lottery or Europe’s EuroMillions or the Quick Pick used in nearly all USA Lottery games – which means that you can ask the lottery retailer or computer to randomly select all your Lottery numbers for you. So – playing the German Lotto is simple – just select your own numbers or request them to be automatically generated for you by using the computer's or retailer's random number generator. The cost of each single entry into the German Lotto is € 1. German Lotto 6 aus 49 – Who Can Play? 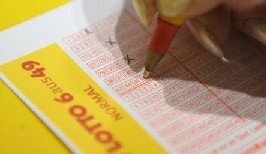 As with the majority of lottery games around the world – previously only citizens living in Germany itself were permitted to participate in any of the Germany Lottery games including the German Lotto – you used to have to purchase your German Lottery tickets from an authorized retailer based within Germany. Today though – this is not a concern as there are a good number of online lottery ticket sales companies such as TheLotter and WinTrillions which are both authorized and genuine – you are able to select your Lottery numbers online and buy lottery tickets for the Lotto 6aus49 from almost anywhere in the world. This is great news of course if you live outside of Germany and want to play the German Lotto and ensure your entry into the next draw or simply want to have the convenience and ease of being able to buy lottery tickets online. You will need to be 18 years of age to be eligible to purchase a ticket for any of the German Lottery games including Lotto 6aus49. Once you have entered into the German Lotto draw – you can then easily check the lottery results online to see how you have done and to find out if you have become one of the lucky winners. The German Lottery Results can be checked from numerous sources after the draw has taken place each Wednesday (6.25pm) and Saturday (7.25pm). The winning German Lotto 6aus 49 numbers will be broadcast on television on the ZDF TV network on Wednesdays at 6.54pm and also on the ARD TV network on Saturdays at 7.57pm just prior to the evening news. A "live" broadcast of the Lotto 6 aus 49 drawing will be made on draw nights on the oficial German lottery website – lotto.de. The German Lotto results will also be published in various newspapers throughout Germany and you can also revisit Global Lottery Review to check the very latest German Lottery Results. The biggest jackpot ever to have been won to date on the German Lotto 6 aus 49 has been the massive € 45.4 Million which was won by 3 lucky players on December 5th 2007. .Prior to this – the largest jackpot on the German Lottery had been € 37.7 Million which was won on October 7th 2006 on a single ticket. At the time of writing this still ranks as the biggest single ticket win on the Lotto 6 aus 49. 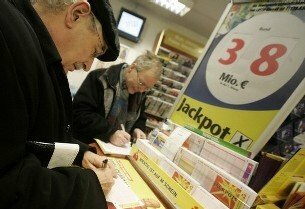 Other big German Lotto jackpot wins include the € 35.04 Million which was won on January 31st 2009 and the win just eight months later of € 31.73 Million on September 23rd 2009. If you are the lucky winner of a German Lotto 6 aus 49 jackpot – you will be paid your winnings in the form of a cash lump sum. All German National Lottery prizes are paid out as cash. The rules regarding prize claim time limits and the size of win that you can be paid directly by retailers or will need to claim from prize claim centers will vary depending upon which of the 16 States within Germany that you have purchased your lottery ticket from. Naturally – if you are playing the German Lotto 6aus49 online with a recognized lottery ticket sales company such as TheLotter or WinTrillions – you will automatically be paid your prize money directly into your bank account when you play lottery online. Proceeds from the German Lottery go towards funding numerous good causes within Germany benefitting both the Federal republic and its people.